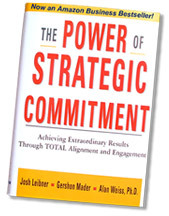 The Power of Strategic Commitment shows you what total alignment and engagement looks like. It also GIVES YOU THE TOOLS and METHODOLOGIES to achieve, measure, track and maintain them. Drawing on the field expertise of three leading consultants and featuring eye opening examples from their exceptional client rosters, the book serves as both an inspiration and a step-by-step guide to driving growth and profit through true involvement. This book is a must read for those wanting to get their executive ranks rowing in the same direction toward common objectives. No matter where in the world your teams are located, or what industry you are in, alignment is more important now than ever. The concepts in this book have been invaluable in building a culture of accountability and no excuses within my global organization. Everyone wants and needs that to win; finally a proven way to achieve it!